Woodhouse Street, Leeds, in the Chapel Allerton Circuit lost eight men, whose details follow. None are otherwise commemorated in this country. Pte. James Gamble 10th Bn. West Yorkshire Regt. Pte. Sydney Gower 15th Bn. West Yorkshire Regt. Capt. Walter Moorhouse 15th Bn. West Yorkshire Regt. 2nd Lt. Alec Ward 15th Bn. West Yorkshire Regt. Pte. 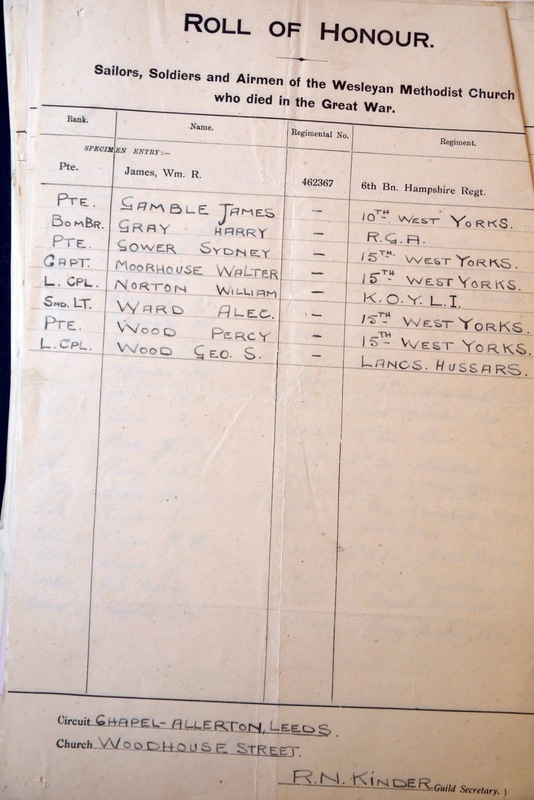 Percy Wood 15th Bn. West Yorkshire Regt.